ADA Compliant Adjustable Spring Sizes 1-6 Architectural Hold-Open Door Closer with Slim Cover Norton Door Controls offers traditional surface, industrial economy, overhead concealed, security, commercial, architectural, electromechanical and electrified closers. To complement the closers, Norton also offers a unique range of arms to help provide maximum door and frame protection. Since 1957, Norton Door Controls have been manufactured in Monroe, North Carolina. Adjustable through the power range of sizes 1 through 6; as outlined in ANSI/ BHMA specification A156.4 option PT 4. H.Closers will also comply with the opening force requirements as outlined in the Americans with Disabilities Act (ADA) and ANSI/BHMA standard A117.1 for interior doors. Rack & Pinion Operation Provides a smooth constant control of the door through its full opening and closing cycle. 180- door swing can be achieved when door, frame, hardware and arm function do not interfere. 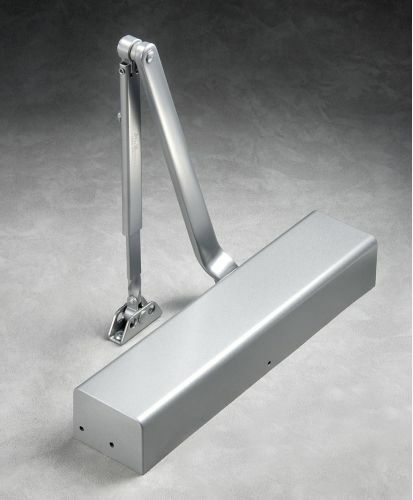 Door closers is non-handed and can be installed on either right- or left-hand swing doors. Pinion shaft extends vertically through the closer body in both directions. Sweep Speed Control Valve Allows adjustment of door speed from the door s full open position down to approximately 10- from the closed position. Latch Speed Control Valve Allows adjustment of door speed from approximately 10- down to the door" s fully closed position. Tri-Style 8301/8501 comes with screws, brackets and soffit plates to allow for regular, top jamb, and parallel arm installations.